A4 Size 7.1 x 10.7 in. (180 x 272 mm) 8.3 x 11.7 in. (304 x 458 mm) 13 x 19 in. (355 x 530 mm) 17 x 24 in. LARGE 21 x 31.5 in. (530 x 800 mm) 24 x 35 in. This thangka depicts the assembly of the forty-two 'peaceful' (zhi) and fifty-eight 'wrathful' (khro) deities that constitute the Hundred Peaceful and Wrathful Deities of the Zhitro (Tib. zhi-khro) or Bardo Mandala. These deities are precisely described in the well-known text of the Bardo Thodol or 'Tibetan Book of the Dead', as they sequentially arise from the heart, throat and crown chakras during the forty-nine day period of the 'intermediate state' (bardo) that is said to occur between death and rebirth. Contemporary thangkas of the Bardo or shitro Mandala of Peaceful and Wrathful deities are relatively rare, but this beautiful thangka and is completely accurate in its detail and iconography. At the top centre of the painting are the blue primordial Buddha, Samantabhadra, and his white consort, Samantabhadri, who represent the union of pure awareness and emptiness. Directly below appear white Vairocana Buddha and his consort, who are enthroned at the centre of the 'Mandala of Peaceful Deities', and surrounded by the five vidyadharas or 'knowledge-holders', who dance upon clouds with their female consorts. Surrounding this cluster of deities are four rainbow circles that enclosed the four directional Buddhas and their consorts, who are each flanked on either side by two male Bodhisattvas, and above and below by two female Bodhisattvas. In the blue eastern rainbow circle are Aksobhya-Vajrasattva and his consort. In the yellow southern circle are Ratnasambhava and his consort. In the red western circle are Amitabha and his consort. And in the green northern circle are Amoghasiddhi and his consort. To the left and right of these rainbow orbs are the 'eight gatekeepers', and the 'six sages'. The eight gatekeepers manifest as four wrathful deities and their consorts, who are coloured white, yellow, red and green to correspond with the four directions. The six sages appear as six standing Buddhas, whose colours and attributes correspond to the 'six realms of cyclic existence': white (gods), green (jealous gods), red (hungry ghosts) on the left; and yellow (humans), blue (animals), black (hells) on the right. Collectively this assembly in the upper sky area represents the 'Mandala of the Forty-two Peaceful Deities', and the assembly of the 'ten vidyadharas' or knowledge-holders. In the upper left and right corners of the painting are blue Vajradhara with his consort, and white Vajrasattva. Dominating the centre of the painting is Mahottara Heruka, who is wrathful, brown in colour, with three triple-eyed faces, six arms, vajra-wings, and stands in sexual union with his blue consort amidst a blazing mass of wisdom fire. In front of Mahottara is a fiery skull-cup that contains the 'wrathful offering of the five sensory organs' (eyes, ears, nose, tongue, and heart). Behind these sensory offerings is a triangular torma or 'sacrificial cake', which emanates flames and rainbow light. And to the lower left and right of the central skull are two smaller skull-cups mounted on skull-tripods, which contain a heart and eyes, and the 'five great forbidden meats' (cow, elephant, horse, monkey, and dog). Surrounding Mahottara's lotus throne are the eight matarah or 'mothers'. These wrathful goddesses are two-armed and human-headed, and they dance amidst clouds and winds holding their various attributes and weapons. Mahottara Heruka and his consort, Krodheshvari, are the wrathful manifestations of the Samantabhadra and Samantabhadri, and they appear are surrounded by the corresponding wrathful manifestations of the 'Five Buddhas' and their consorts, the 'Five Mothers'. Each of these five wrathful male and female Buddhas are similar in appearance to Mahottara and his consort, with three faces, six arms, vajra-wings and fiery auras, and each is accompanied by a specific retinue of wrathful goddesses. Directly below Mahottara is brown Buddha Heruka with his light brown consort, who appears as the wrathful manifestation of Vairocana Buddha and his consort. He stands upon a lotus throne borne by eight animals: a makara, leopard, tiger and lion (left); and an elephant, buffalo, jackal and snake (right). These animals are the vehicles of the 'Eight Protector' goddesses that encircle Buddha Heruka's lotus throne, who likewise are two-armed, human-headed, and dance amidst billowing clouds as they hold their wrathful attributes. However, these eight goddesses serve as directional guardians, and are not actually included within the mandala of the fifty-eight wrathful deities. Surrounding Mahottara and Buddha Heruka in the four directional quadrants are the wrathful manifestations of the other four directional Buddhas, who likewise appear with three heads, six arms, vajra-wings, and embrace their consorts amidst a blazing mass of fire. Below each of these four wrathful Buddhas are a group of six yoginis, who collectively constitute twenty-four of the twenty-eight isvari or 'ladies'. All of these yoginis have specific animal or bird heads and colours, and they dance amidst clouds wielding their specific attributes. The remaining four yoginis serve as directional 'yogini gatekeepers', who along with another group known as the four 'female gatekeepers', appear in close proximity to the four wrathful Buddhas. 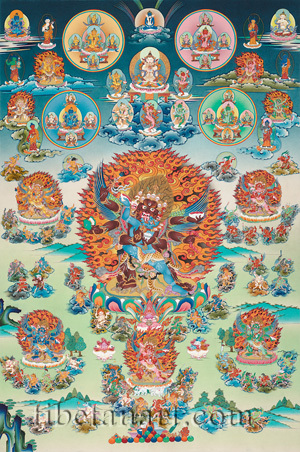 In the east (lower left) is blue Vajra Heruka and light blue his consort, who is the wrathful manifestation of Aksobhya-Vajrasattva and his consort. Vajra Heruka is encircled by the 'six yoginis of the east', with the white cuckoo-headed yogini-gatekeeper and the white horse-headed female-gatekeeper of the east appearing below. In the south (upper left) is yellow Ratna Heruka with his yellow consort, who is the wrathful manifestations of Ratnasambhava and his consort. Ratna Heruka is encircled by the 'six yoginis of the south', with the yellow goat-headed yogini-gatekeeper and the yellow sow-headed female-gatekeeper of the south appearing above. In the west (upper right) is red Padma Heruka with his light red consort, who is the wrathful manifestation of Amitabha and his consort. Padma Heruka is encircled by the 'six yoginis of the west', with the red lion-headed yogini-gatekeeper and the red lion-headed female-gatekeeper of the west appearing above. In the north (lower right) is green Karma Heruka with his light green consort, who is the wrathful manifestations of Amoghasiddhi and his consort. Karma Heruka is encircled by the 'six yoginis of the north', with the green snake-headed yogini-gatekeeper and the green snake-headed female-gatekeeper of the north appearing below. The last group of wrathful goddesses, which collectively form part of the 'Mandala of Fifty-eight Wrathful deities' are the 'eight pishaci'. These are a class of female spirits that appear in the retinue of many wrathful deities, where they are often identified as witches, flesh-eaters, or possessive spirits. Four of these pishaci are animal-headed and appear to the left of Mahottara's lotus throne, while the other four are winged and bird-headed and appear to the right of Mahottara's lotus throne.